How to implement a holistic approach to prevent Early School Leaving? Early School Leaving is a complex phenomenon, which is not possible to be resolved with an improvised intervention. Rather through multiple, plannedstrategies, with the coordinated participation of several facilitators, with a clear understanding of the needs to be addressed during itsimplementation. The EUMOSCHOOL approach experience has given some suggestions on how to put into practice a holistic intervention, trying to involve different facilitators thus creating a positive environment capable of reducing risks and situations leading to the discomfort and stress which may cause early school leaving. This is not without its challenges: not all the partners found it easy to implement such a holistic approach, in the majority of cases, the implementation of the DoE techniques raised the awareness on the topic of developing approaches to prevent ESL. The use of the approaches has enabled relfection and discussion about developments in future years and how schools feel they can focus on enhancing their provision to reduce ESL. School (meaning the system supporting teachers and all the educational figures around). 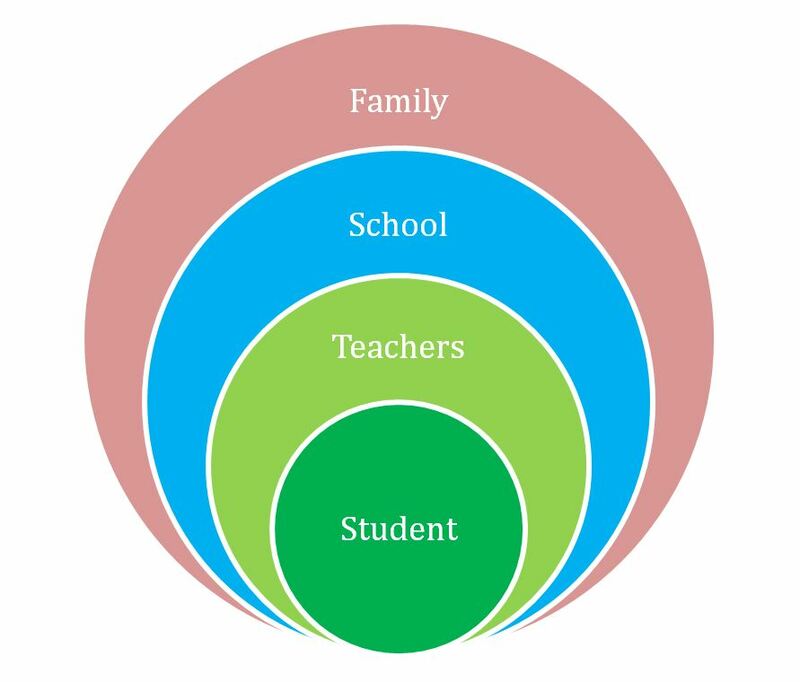 As the graphic shows, each facilitator is involved in a relationship with the student. The image here represents the relationship with the student from an educational point of view, within the school environment. The more coordinated this approach is, the bigger the impact will be. Within this co-ordinated approach, the teacher has a significant role. Where do we need to start from? The first step is to know in detail the needs of students and the context for involvement. Once faciliators are familiar with the DoE approach, planning can take place to identify the selection and order of the DoE tools to be implemented. As teachers, understanding the specific needs of your pupils is key to effective practice. This understanding is not soley focused on their learning needs but also their wider family context and how this might impact on them individually and within an educational environment. The way in which the classroom is managed is based on an understanding of; if, when and how to support and intervene to ensure the emotional security of the students. Sometimes it is not easy to meet all the emotional needs of the classroom or a specific student, identification helps to understand and develop an appropriate response, in some cases this may involve using other support services, such as a psychologist. Sharing perspectives and thoughts with colleagues is an important process in order to clarify and plan a supportive approach. The DoE can be an important tool to facilitate a supportive approach with your students. Reading the theory on which this approach is based will enable an understanding of the basis of the DoE and provide facilitators with the rationale that supports further dialogue with colleagues. The intention of providing this background information and theoretical knowledge base is to generate wider participation and in turn greater success in the implementation of an emotional education approach. Having completed the learning course, the introduction of the DoE can be planned. It is understood that there may be potential barriers to implememting the approach. Experiences from the Emotional Training Center, which has used the methodology on large samples of schools, suggests that these barriers are largely related to school systems, such as; the demands on teachers, including implementing other changes or new initiatives, differing views and possible resistance from teaching staff. It is key that all stakeholders are involved in the planning of the DoE; the principal, teaching colleagues and especially the parents. This is to try and ensure that everyone is supportive of the approach, enabling a holistic perspective resulting in the greatest impact for students in the longer term. Leadership and management is key to the successful implementation of the DoE. Agreement from the school principal is essential to enable a whole school approach. Planning and writing a proposal is a useful way to present the DoE. The proposal can be tailored to the specific needs and networks within the school, illustrating the way in which it connects with key school prorities and initiatives and how it will benefit students and the school as a whole. Establish need: Are there specific issues / concerns in the school/class related to emotional discomfort? Use examples to support. Establish support: Are there teachers /staff who think this approach can be useful and whowill work together? Link to school ethos/vision/goals: Are there potential connections with other projects to link with as a basis for implementing the DoE? Identify key leadership and management roles that could support the DoE: consider specific staff members with pastoral roles / interests within emotional education. Identify wider support: Use available support services/psychologist in/for your school to support the proposal. Overcoming potential barriers: Highlight that the implementation of DoE does not have a financial cost and the benefits for students. Use documents / report (EUMOSCHOOL Comparative report) which demonstrates the importance of emotional education and emotional training for teachers. Proposal meeting: plan a meeting with the school principal / leadership and management team, appropriately timed, in order to include the EUMOSCHOOL DoE approach in the strategy of your school. A “team” of teachers, who share the will to participate and implement the program, small groups of colleagues, teaching partnerships or individual teachers. There are benefits to working collaboratively, ensuring consistency throughout age groups and continuity between age groups. When this is not possible individual teachers have been able to illustrate impact for the students with whom they work. Colleagues that express an interest can utilise the flexible online learning resource. They can also access the planned DoE techniques or adapt these tools to meet their classroom needs. Involving parents enables greater support for the DoE. This helps to ensure a more complete emotional learning environment: it is more likely the students will be given a similar perspective on emotions at school and at home. Otherwise, the risk is that what has been learned at school can be lost or partially “changed” at home. Introducing the DoE alongside planned parental meetings and providng links with literature / resources provides parents with the opportunity to ask questions and for schools to receive feedback. The on-line learning resource can be referred to in order for staff to respond to parental questions. Presenting the benefits of the DoE typically results in a supportive response from parents, which positively impacts on the outcomes for students. Terms such as; neurobiology, mirror neurons and changes in the braincan be considered too specific and are not well-known, this can lead to confusion and misunderstanding, when time is limited., Focus on key points and highlight the importance of emotional education to support the emotional wellbeing of their children.. Develop short reports on classroom activities throughout the year, provide feedback illustrating the impact of the activities to maintain the motivation of parents and colleagues. Showing results is an important and valid way to gain consensus and to promote cooperation. Regular communication with parents also enables specific intervention in some cases and co-ordination of appropriate support strategies to meet individual emotional needs. Summarising outcomes with parents at the end of the year provides time to review and reflect and plan ahead. In order to develop a holistic approach to implementing the DoE, planning and time are required, alongside communicating and working with all stakeholders. Influencing factors will be be specific and unique to each school and often require creative approaches to overcome potential barriers. The FAQ section also includes further suggestions for implementing the DoE.